Arapaima fishing at IT Lake Monsters Thailand is a highly attractive proposition for international specimen anglers whilst on their fishing holiday in Thailand and wishing to do battle with one of the world’s largest freshwater fish. The awe inspiring armour plated Arapaima Gigas or Pirarucu is a monster freshwater fish indigenous to Brazil, Peru, Colombia and several other countries in the Amazon basin in South America but has become endangered due to over fishing and habitat destruction.Although the Arapaima or Pirarucu is a monster fish that is not indigenous to Thailand this monster fish species ranks amongst the largest freshwater giants of Thailand. Arapaima and various other monster fish have been introduced into Thailand by enterprising fish farmers in the last two decades for supply to commercial fisheries and ornamental ponds.The fearsome and predatory looking Pirarucu or Arapaima is the largest scaled freshwater fish in the world and is capable of reaching weights approaching 180kg’s+ and lengths of almost three metres. The Arapaima is a prehistoric living fossil which is covered with a thick armour of large interlocking scales further adding to its ferocious and predatory appearance.The Arapaima is one of the most striking and distinctive giant fish of Thailand displaying a vibrant bright red colouration towards the tail section of its huge elongated body.This giant freshwater fish and apex predator has adapted through an amazing evolutionary process the incredible ability to breathe oxygen allowing the Arapaima to survive in oxygen depleted pools. IT Lake Monsters in Thailand is an established commercial fishery situated in Ratchaburi which has a history of producing some of the largest Arapaima in the world. 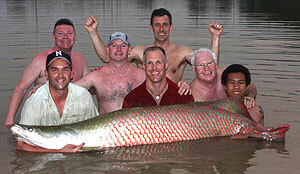 Also offering some of the most prolific Arapaima fishing available in Thailand. The lake is located in Ratchaburi province which is a pleasant two hour journey through rural and agricultural surroundings from the hustle and bustle of Bangkok. On arrival at IT Lake Monsters in Thailand anglers will be greeted by a charming freshwater fishery set in pleasant well kept grounds covering an expanse of five acres of predator filled water with variable depths between two and five metres.Whilst fishing for Arapaima in Thailand anglers will fish a variety of predator fishing methods and techniques including free lining, float fishing, dead baiting and live baiting. Arapaima fishing at this venue can be described as being highly prolific and will see the angler fishing with either live or dead bait with one rod for the entire day. The highly predatory Arapaima or Pirarucu, has evolved over thousands of years to become an extremely efficient hunter and can be seen surfacing at regular intervals around the lake as it actively hunts prey fish and gulps air. When hooking a large Arapaima whilst fishing at IT Lake Monsters anglers will experience the raw power of one of the largest freshwater fish in the world. 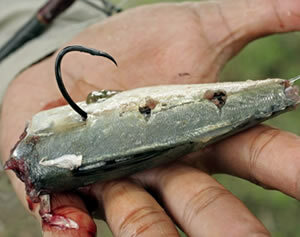 On setting the hook into the bony mouth of an Arapaima the monster fish regularily embarks on a series of unstoppable high octane runs violently stripping line from the anglers reel! The speed and acceleration of this giant monster fish is legendary with the Arapaima aggressively thrashing its head, tail walking and sometimes becoming airborne during the course of the battle! A battle on rod and line with the prehistoric and predatory Arapaima can last anything up to an hour testing the angler’s skill and nerve to the absolute limit and requiring several guides to land! After the netting of a large Arapaima it is important that the utmost care and respect is shown to the fish by allowing the giant fish a short period for recovery in a holding pen. The Arapaima is a notoriously fragile fish after capture and is prone to mortality if not handled correctly, it is therefore essential that the Arapaima is handled by highly experienced fishing guides and given sufficient care and attention during this period of recovery. When the Arapaima has recovered sufficiently from the stress caused during the battle the monster fish can then quickly be photographed whilst being held in the water before release. Arapaima Fishing at IT Lake with live or dead bait for a full day has previously produced large Arapaima weighing in the excess of a gigantic 150 kg’s in addition to producing a wide variety of other hard fighting exotic freshwater monster fish species. 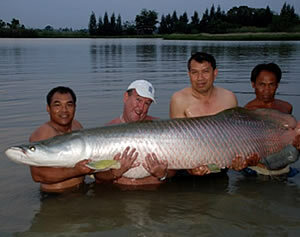 Whilst predator fishing for Arapaima at IT Lake Monsters anglers will also catch a wide selection of other exotic monster freshwater fish species such as the muscular Redtail Catfish, Chaophraya Catfish, Sorubim, Alligator Gar and a whole host of other weird and wonderful heavy weight predatory monster fish. Predator Fishing at the lake for Arapaima and other monster fish is open to anglers between the hours of 06.00am and 18.30pm with our daily fishing expeditions to the lake beginning at 05.30am from a prearranged pick up point in Bangkok. The daily itinerary for our Arapaima fishing trips in Thailand for Arapaima and other predators is listed below. Holidaying anglers wishing to visit this venue in search of large Amazonian predators will be collected by a Fishsiam representative at their Bangkok hotel and transported to the lake in Ratchaburi province by air-conditioned minibus. 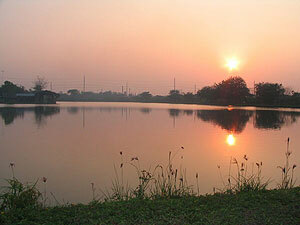 The transfer time is approximately two hours from central Bangkok. On arrival at this record breaking venue the angler(s) will find a wonderfully scenic lake of some five acres nestled amongst lush green fields. IT lake has one main structure affording the angler(s) some shade from the sun in addition to serving refreshments. 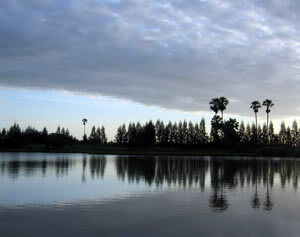 The lake is ideal for lure casting and fly fishing with little surrounding vegetation to impede the angler(s) casts. Fishsiam has secured an agreement with the owner of IT Monster Predator Lake allowing the use of one rod fishing a combination of live and deadbait tactics throughout the entire day. Employing these under supervision of our guides the angler(s) will experience spectacular action from a variety of native and imported predatory species. The angler(s) will be accompanied by a Fishsiam guide throughout the day who will assist with all photographic and netting requirements in addition to any other angling requirements. Throughout the days fishing the angler(s) will be supplied with all livebaits and terminal tackle, in addition fly fishing and lure fishing are also permitted at IT Monster. Massive Arapaima gigas are accounted for by Fishsiam clients on a regular basis using these tactics in addition anglers also regularly catch Redtail catfish, Sorubim, Giant Snakehead and various other predatory species. Fishing with live and deadbaits at a highly prolific venue like IT is extremely productive with large captures on a regular basis and the possibility of a world record predator! The Fishsiam team has accounted for several Arapaima gigas of a world record size from this record breaking venue with weights to an estimated 150kg. At the end of the days fishing the angler(s) will be returned to your Bangkok hotel by air-conditioned minibus. Fishsiam offer daily Thailand Arapaima fishing trips to this venue in addition to weekly packages with various accommodation options. Expeditions to IT Monster Predator Lake can also be combined in our tailor made holidays which are designed to meet the visiting angler(s) specific angling requirements.